Jewelry designer Clarissa Knighten creates one-of-a-kind jewelry with artistic wire, gemstones and other found items. This week is the fifteenth season of Kansas City Fashion Week, and Knighten is, for the second time, one of the 28 designers participating. Rissa’s Artistic Design (R.A.D. ), as she calls her company, uses the tagline "Earthy Edgy Elegant." The self-taught designer will show "Edgy" on 10 models outfitted by The Buckle at Oak Park Mall. Think bike chains and wood; she deconstructs the chains and reassembles with added beads or stones. The finale of this year's collection is a currently secret shoulder-to-shoulder piece made of small wood planks, each with light blue resin running through them. Knighten's current Fashion Week designs are still under wraps. This is a piece from her 'Elegant' line. When women (and sometime men) doubt that they'll be able to carry off one of her showier pieces, she invites them to her studio. What is the person comfortable wearing? Then she pushes a step beyond that. "I would challenge you to wear it out. If you receive less than 10 compliments in that day, bring it back to me," she says. As someone who only went full-time in design in 2017 after being laid off from IT and marketing at a big corporation where she worked for 19 years, Knighten doesn't play by rules of design schools or youth. When choosing from the pool of about 1,000 prospective models this season, Knighten looked to diversity as another tool to show people that they can step out of themselves by wearing her work. "When my models came down the runway" — some of them in their 50s, Knighten explains — "the people in the audience who were my clients could hear people say, 'Oh, that’s me. I could do that.'" 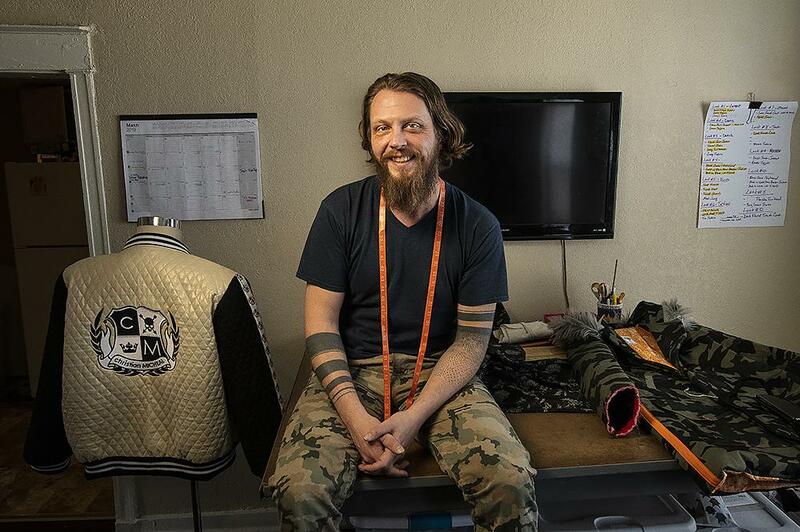 Christian Michael Shuster's designs are also over the top, but many of his clientele is already equal to it — they're not simply trying something different. Chiefs' wide receiver Demarcus Robinson, for example. He recently purchased a belted floral trench coat with a hood. Christian Micheal Shuster markets himself as a modern menswear designer for the style conscious and fashion forward man. Like Knighten, Shuster is self-taught and entered design after being laid off from a big, local company. But, as an American Civil War reenactor, he came at the industry from a different angle. "A lot of my love of design is drawn from Napoleonic and Victorian-era military uniforms," Shuster says. And, until this season, his work has reflected that look with big brass buttons, braided sleeves and tailored lines. The Christian Michael brand logo is similarly military: a crown and skull shield. But this Fashion Week, he decided to set aside the uniforms and have a different kind of fun. He prides himself on knowing what’s trending, and this season it’s quite a bit of whimsy. "The athleisure side coming into high-end fashion is becoming very regular. You're seeing a lot of fashion lines cross over from an androgynous standpoint for men and women," he explains. And a lot of floral and camouflage for men and women, though this season he's only designing for men. As for the whimsy, he says he's got ducks on his mind. 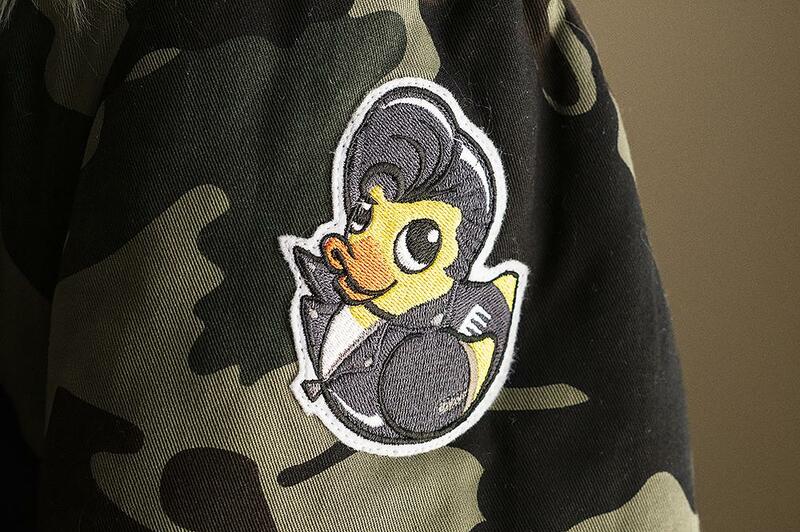 A duck patch adorns the shoulder of a camouflage jacket. "We're seeing a lot of patchwork in men’s fashion and odd combinations with kitschy novelties. My kitschy novelty this season is ducks." One of his pieces is a hooded camouflage trench coat with hunter orange piping down the sides and the words "What the duck?" spray-painted on the back. He’s also pairing floral denim overalls with a short-sleeved white mesh shirt. Like Knighten, he understands that not every client wants to or even can pull off the less-conventional wares — they're not all professional football players. For instance, once the camouflage jean jacket's trim is boiled down to hunter orange top-stitching, it's not that unusual. Practical styles or not, Shuster says, "I think it’s a great feather in the cap of the city to show a fashion week. But, not only show a fashion week, especially one on the level that it's being done here." Wuz Smith isn’t quite sure what his next step is. He recently graduated from Frontier School of Excellence in Kansas City, Missouri, but right now, he’s weighing his options. The Kansas City Art Institute doesn’t offer degrees in fashion design, but students in the fiber department spend plenty of time thinking about clothing, costumes, performance and the human body as a means of expression, says Pauline Verbeek-Cowart, the chair of the department. So when she got a call from Kansas City Museum Executive Director Anna Marie Tutera about co-curating a show called Rituals and Celebrations: Exploring Meaning Through Dress, she was up for it.